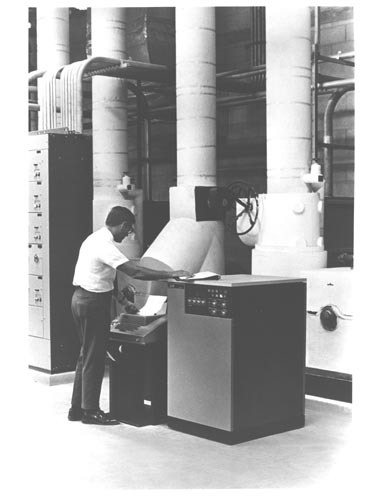 B&W image of a man standing at a terminal and control unit looking at a printout. He is in an industrial setting with large pipes and controls. Verso attached metadata: " TYMSHARE"S NEWEST REPORT GENERATOR -- The new Model 3145 keyboard printer has been introduced in the Tymshare data terminal product line, offering high performance and reliablility at a price will below that of comparable hard copy terminals. Operating a a true 30 cps, the Model 315 provides exceptional print quality and can create as many as six copies. In addition to printing the full ASCII complement of 96 upper- and lowercase characters, Tymsshare's Mocel 315 terminal features a separate 14 key numeric keypad. The extra-wide, 132 column carriage is easily adjustable to handle a variety of paper sizes and formats, from 3 to 14-7/8 inches wide. It allows simultaneous horizontal and vertical tabulation and lets you skip page perforation and automatically space up to a top of a new form. The Model 315 is available for sale ($2895) or lease ( as low as $125/month) through Tymshare offices in major U.S. cities and through affiilates in Western Europe. Tymshare offers a full terminal product line of general-purpose, portable, report-generation, graphics and cassette devices. Contact: Bob Wallace, 408/257-6550 20705 Valley Green Drive, Cupertino, California 95014, 408-257-6650."